We depart late in the afternoon from U.S. on board a scheduled flight, wide-body jet, for Tel-Aviv, Israel. Full service on board. Upon arrival in Tel-Aviv we are met by our representative and transferred to our hotel in Tel-Aviv for dinner and overnight. After breakfast we proceed to the ancient port of Jaffa which has recorded history of 3500 years. We walk through the reconstructed quarter and visit the home of Simon the Tanner, where St. Peter raised Tabatha from the dead. From here we continue to Lydda to visit the Church and Tomb of St. George. Continue to Ceasarea, built by King Herod in 22 B.C. It was here that Peter baptized Cornelius and where Paul was imprisoned while awaiting his trial in Rome. Visit the Roman Theater and Aqueduct as well as the Crusader City and Port. 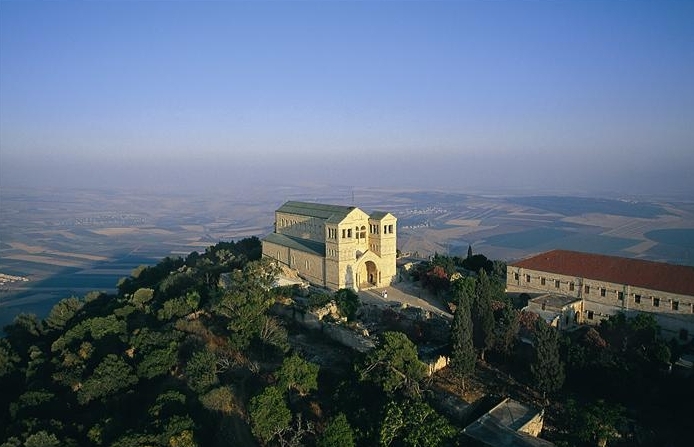 We continue north to Haifa and view the city and its bay from atop Mount Carmel. From Haifa we proceed to Mt. Tabor, site of the Transfiguration and onto Tiberias for dinner and overnight. This morning we cross the Sea of Galilee by boat to Capernaum. Here we visit the ruins of the city where Jesus started His ministry and see the site of the Synagogue where He was teaching. We proceed to Tabgha, site of the Multiplication of Loaves and Fishes. From here, we drive to Mt. of Beatitudes, overlooking the Sea of Galilee. In the afternoon we visit Jordan River for our baptism (becoming a hatzi – a true pilgrim). Dinner and overnight in Tiberias. This morning we leave Tiberias for Cana of Galilee, site of Christ’s first miracle. 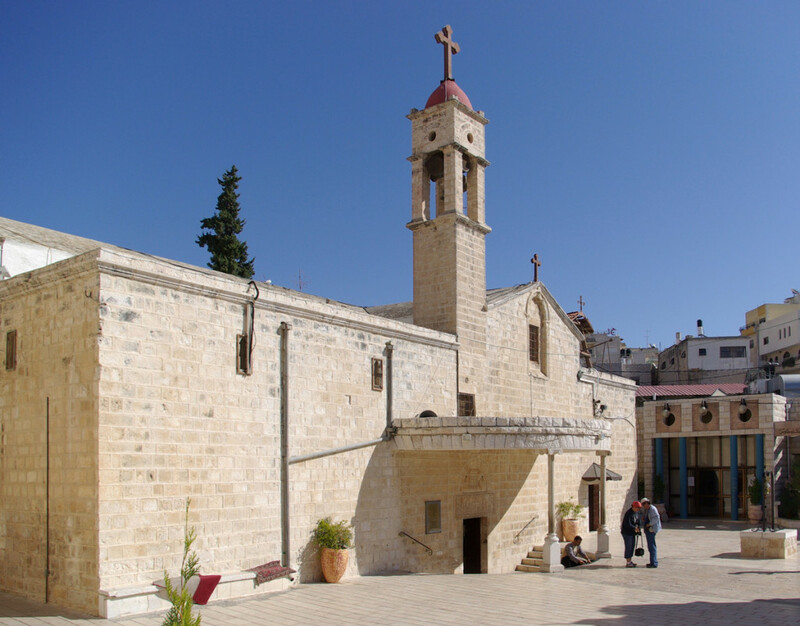 We continue to Nazareth to visit the Greek Orthodox Church of the Annunciation, the oldest Church in Nazareth, where St. Gabriel appeared to Mary. Then continue to Jericho, the oldest city in the world. We visit the Springs of Elisha and the Monastery of St. Eliassaios, built on the site of the sycamore tree where Zacchaus climbed to catch a glimpse of the passing Christ. Continue to Mt. of Temptation where Jesus fasted for forty days. Visit the Monastery of St. Gerasimos on the Judean Desert where St. Mary of Egypt spent her remaining life in prayer and fasting. From here we ascend to Jerusalem for dinner and overnight. This morning we enjoy a spectacular panoramic view of Jerusalem from the Mt. of Olives. Visit the Church of the Ascension, the Peter Noster Church and the Monastery of St. Mary Magdalene, Visit the Garden of Gethsemane, site of the betrayal and arrest of Christ, the Basilica of the Agony (Church of all Nations) which houses the Rock where Jesus prayed. Continue to visit the Tomb of Virgin Mary (a short paraclesis service will be held). Proceed to Via Dolorosa (Odos tou Martiriou) where we will enter the old City via St. Stephen’s Gate and proceed along the way of the Cross. 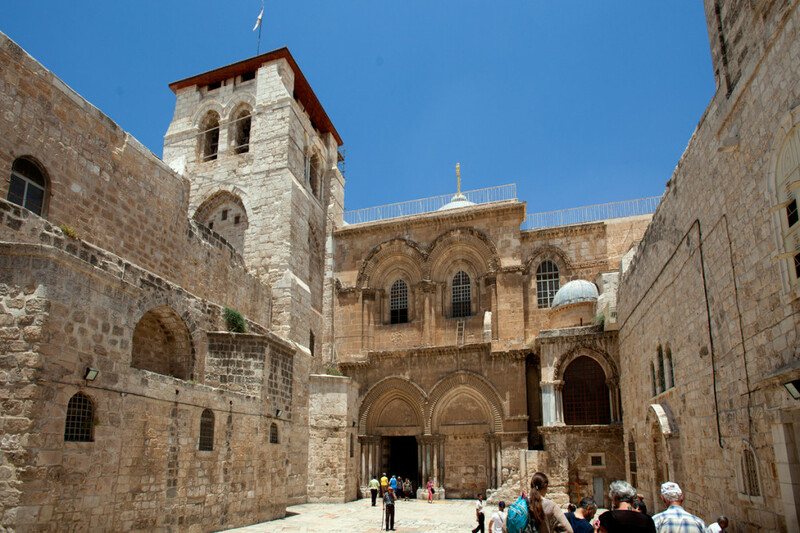 Visit the Pool of Bethesda, St. Anne’s Church, the Lithostrotos, the Praetorian, and Christ’s Prison and reach the Church of the Holy Sepulchre for an extensive visit. Return to the Hotel for dinner and overnight. 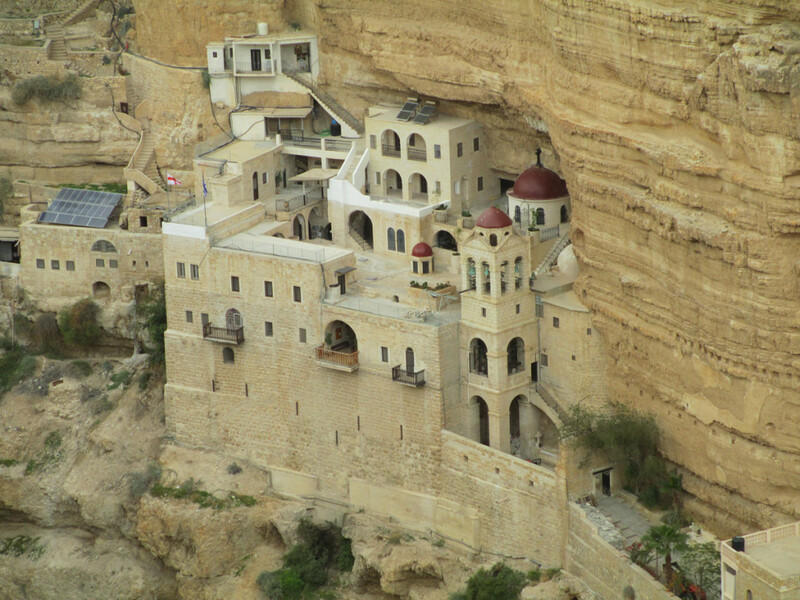 After breakfast, we visit St. Elias Monastery, built on the site where the prophet Elijah rested during his journey to the desert. Proceed to Bethlehem, the birthplace of Jesus and visit the Church of the Nativity, the Chapel of the Manger and nearby Milk Grotto. Visit the Shepherd’s field and the Monastery of St. Theodosios. Continue to Ein Karem, the birthplace of St. John the Baptist and visit the Church of the Visitation. At Mt. Zion we will have the opportunity to view the Room of the Last Supper, the Western Wall and the Golden Gate where Jesus entered Jerusalem (Palm Sunday). Return to our hotel for dinner and overnight. This morning we transfer to Tel-Aviv airport for our flight to Istanbul. Upon arrival we’ll be met by our representative and transfer to the hotel. Balance of the day at leisure. Dinner on our own. After breakfast we enjoy a full day sightseeing of Istanbul with a visit of Dolmabahce Palace. 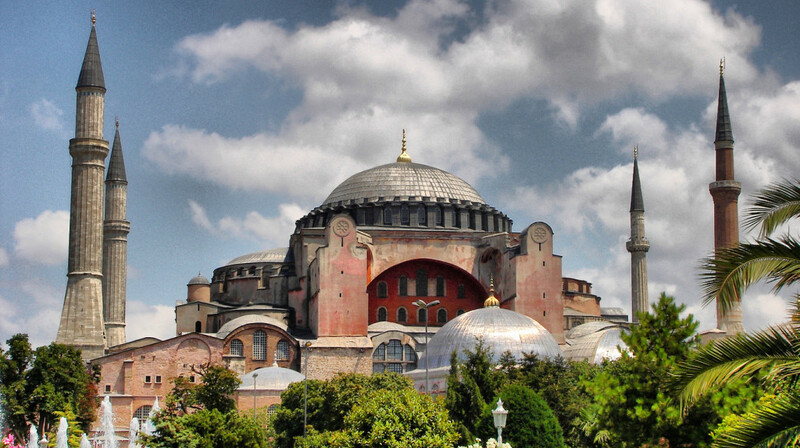 Continue our tour with the visit of St. Sophia – the church of the divine wisdom, one of the greatest marvels of architecture constructed as a basilica in the 6th century by Emperor Justinian. Hagia Irini – (at Topkaki Palace Garden) – church built on the site of a Pagan Temple of Aphrodite. After our lunch at Konyali Lokantasi in Topkaki Palace we continue our visit of Topkapi Palace – imperial residence of Ottoman Sultans exhibiting imperial treasury, Chinese porcelain, weapons, calligraphy section. The tour will end with a visit of Grand Bazaar – jewelry, gold, carpets and leather ware. Dinner on our own. After breakfast drive to Patriarchate for a visit. After Our visit, we continue our tour with the visit of Moni Hora (Museum of Kariye) The Greek Patriarchate has been on this site since 1601. The complex which has administrative offices of Greek Patriarchate has been the seat of the Ecumenical Patriarchate of Constantinople. Among the lerics displayed in the church, we can mention the tombs of Saint Omonia, Thephano and Saint Euphemia. Panaghia Vlahernon. Continue our tour with the visit of the Blue Mosque, Hippodrome – center of sporting events and political activities of the old city; Moni Sergiou Kakhou built by Justinian in memory of the two saints. Dinner on our own. After breakfast transfer to the airport for our return flight to US, where we arrive early in the evening of the same day.